Are your channel partners underperforming? Would you and your organization benefit from effective channel partners? Channel selling delivers boundless benefits to product and service providers (annual sales of $7 trillion in the U.S.), but often channel partners underperform. Strategy — The Structural Foundation: How to structure your channels and strategize based on your goals. Motivation — Recruit, Train, Incent: What can you do to catapult sales through smart recruitment, training and incentives. Communication—Ties That Bind: How to build effective communication between channels. Whether your current sale channel partners are underperforming or you are looking to jump start new sale channel partners, in the white paper “How to Jump-Start Underperforming Channel Partners,” I will show you the keys to building your sale channel partners and setting up your organization for success. What’s more, you’ll get access to a case study about how RedHat, the world’s leading provider of Open Source Enterprise IT products and services, uses the value of customized training programs build effective channel partners. 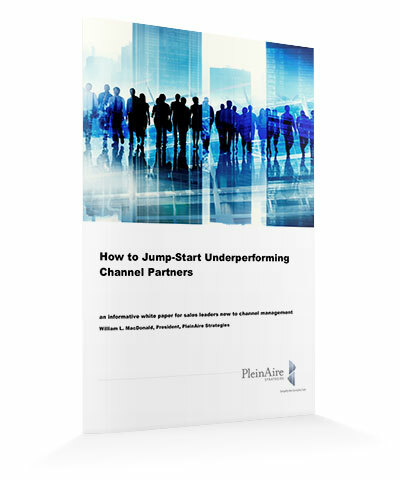 Fill out the form below to download “How to Jump-Start Underperforming Channel Partners” and the RedHat Case Study.